Fundraiser by Karen Lee : SAVE THE B & G MACAWS OF SO. FLA.
SAVE THE B & G MACAWS OF SO. FLA. The only place I know in the United States where you can see wild blue and gold macaws flying free is here in south Florida. They do not negatively impact the south Florida ecosystem. They do have a positive impact on our economy. Hundreds of bird watchers have been to my location over the past 16 years to see the macaws. They have come from as far as Europe and the northern states of the USA. Meaning they spend money while they are here watching our birds. These birds are constantly under seige by unscrupulous and greedy humans who want to poach them from the wild and sell them to pet shops who will then sell the wild bird to a unknowing customer. These birds are wild and will never be tamed. They make terrible pets. We need to stop the poachers. 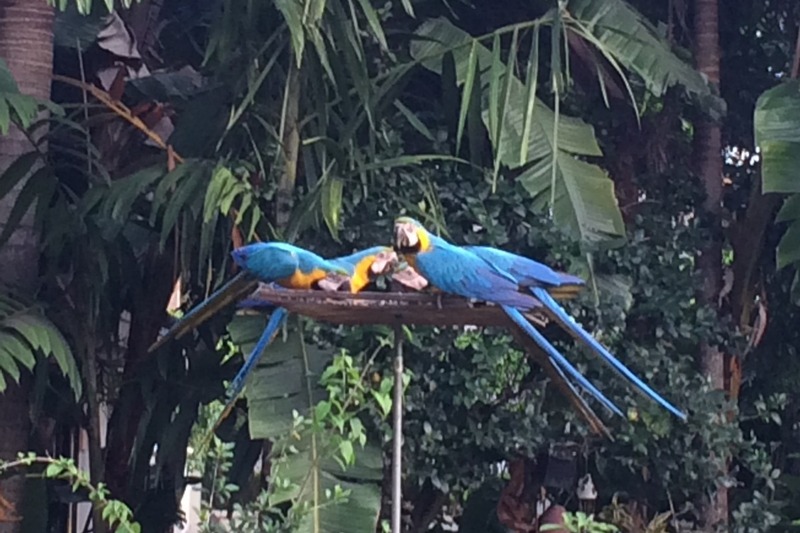 The macaws are only vulnerable at night when they are nesting or breeding. For that reason we need to give them a safe place to do so. We can do this by planting royal palm trees on private property. They only nest in be-headed royal palms. We need to raise the funds in order to pay for the palms, the transportation of the palms and the planting of the palms. Since they need to be mature palms and at least 30 feet tall, the transportation and the planting requires expensive heavy equipment including trailers and cranes.